Stiegl Radler Grapefruit – the naturally fruity thirst quencher. 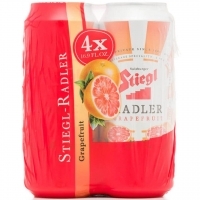 Stiegl Radler Grapefruit quenches your thirst and has a wonderfully fruity grapefruit aroma. 100% natural ingredients, 0% artificial sweeteners and colouring agents. Stiegl Radler Grapefruit is the perfect low alcoholic beverage for calorie conscious consumers. No matter if you are around on two wheels or two legs.